As a search engine optimization professional, I am regularly asked by my clients what keywords I think they should rank for. If you practice SEO, then no doubt you’ve heard that question many times yourself. Of course, it doesn’t matter what keywords I think they should rank for, it matters what keywords people are searching for and how much work it will take to rank for those keywords given the current strength of the client’s site. Many factors come into play in that assessment, including the client’s budget for adding high-quality citations from related sites. 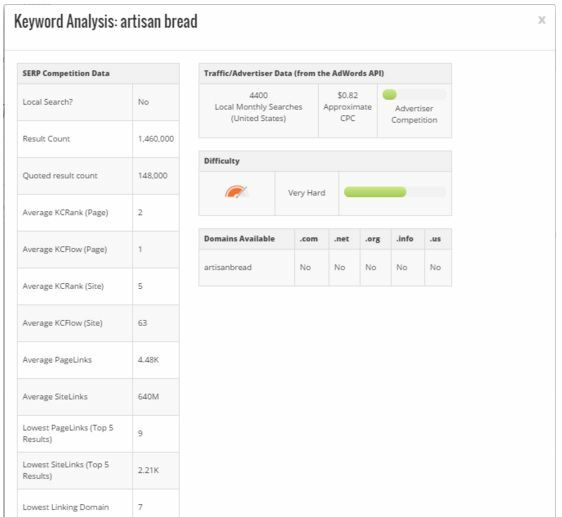 Because this subject routinely arises, I wanted to lay out my own methodology for selecting keywords and analyzing the competitiveness of those terms. That’s the focus of this article. It combines the data returned by Google’s Keyword Planner with backlinking data from Majestic and site/page TrustFlow metrics to arrive at a pretty accurate difficulty rating figure. 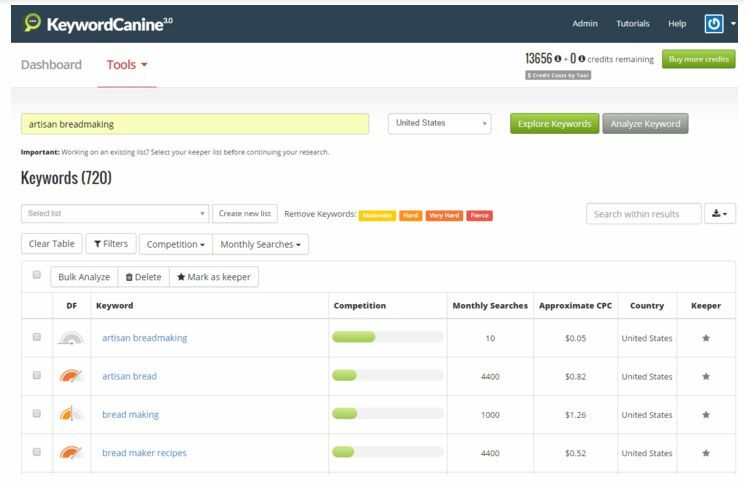 It allows you to filter results by the difficulty level, but also by the number of terms in the keywords (great when looking for good long-tails), the advertiser competition, number of monthly searches, approximate CPC and country. For big projects that are targeting numerous keywords, you can easily save the results you choose into project lists for reference later. When you need more detail about the results that went into the analysis, 21 data points are just a single click away. The general manager of my company (Amin Motin) and I held a webinar on December 12th where we showed people how to make effective use of Keyword Canine. During our rehearsal for that webinar, we happened upon the keywords you see in the screenshot above. Amin happens to have a passion for cooking and making bread, so we looked it up to see how difficult it would be to rank. As it turns out, artisan bread was remarkably ripe for a pretty easy ranking. Although the difficulty factor assigned to the keywords by the Explorer was “Very Hard” (thus its dark orange icon pictured in the screenshot), my instinct told me there was more to the story. The advertiser competition was rather low (only 22 out of 100), yet the keywords received 4,400 searches a month — not an insignificant number. As you can see above, the Keyword Analysis packs in a lot of data that is very useful to an SEO professional. If you’re starting a new site, knowing whether or not an Exact Match Domain is available immediately is very handy. Then there’s all of the data in the table down the left. 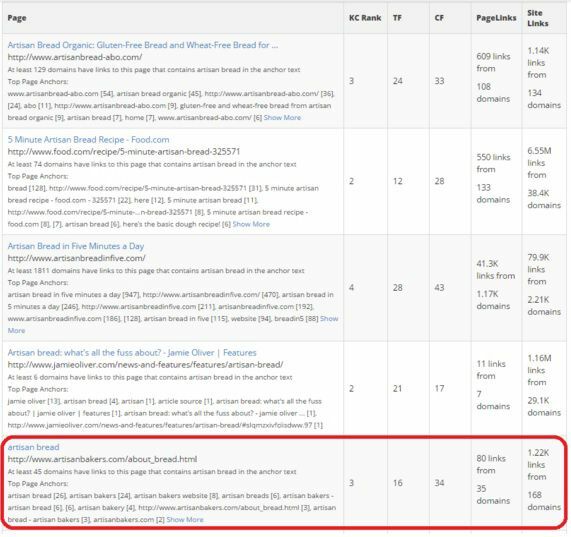 Those data points are gathered from the top 10 ranking results in Google unless otherwise noted in the description column. KCRank is Keyword Canine’s replacement for public PageRank (may it rest in peace). It’s determined by a combination of data points taken from the various APIs Keyword Canine ties into (Majestic, Moz, etc). That image starts at ranking result number three, because it’s the site ranking in position six that I want you to see. 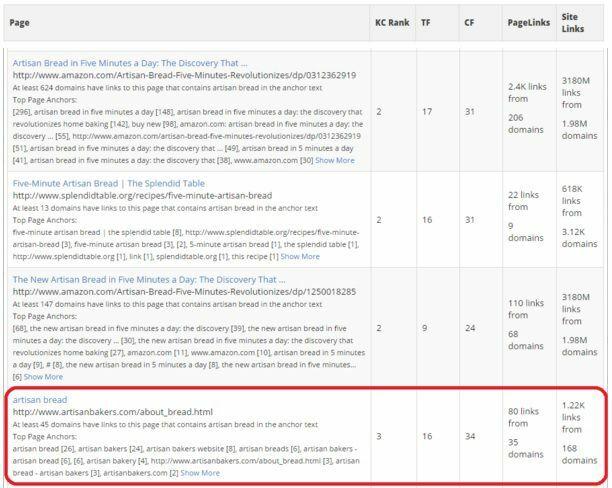 In amongst the results with thousands (or even millions) of linking domains was a crumby little inner page from ArtisanBread.com (pun intended). The number of domains linking to the entire site was very low in comparison to the rest of the sites ranking for the terms, and the links aimed at the page itself were paltry. From this it was starting to become clear that it would be easy to rank for these keywords, but I was still left with the question of how many quality links I was going to need to achieve that ranking. As any good SEO professional knows, it’s not the quantity, but the contextual relevance and quality of the linking site and linking page that makes for the ranking (assuming all on-page factors are as they should be). 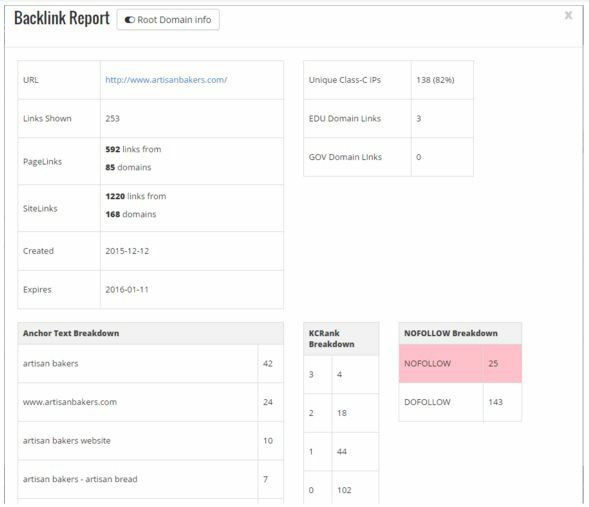 The Backlinks Report in Keyword Canine is great because it breaks down everything you need to know about the links: their anchor text, their strength, their nofollow attributes, etc. Although you can’t see it in the image above, it also returns a full list of the links found and their attributes (KCRank, Anchor Text, PageLinks, and SiteLinks). With one click at the top of the report, you can quickly switch between the links to the full site or just the specific page being analyzed. You can see from the anchor text breakdown that the site is benefitting from having the Exact Match Domain ArtisanBakers.com. Despite the majority of the links containing that exact anchor text or a derivative thereof, there’s clearly no overoptimization penalties being applied by Google. Still, the KCRank breakdown shows the relative weakness of this site’s link profile. The great majority of the links have no KCRank. Though some of the linking pages are on sites that are quite strong, the KCRank isn’t flowing down to the pages much — indicating that the pages are buried deep within the sites where the flow has tapered off. So my intuition about artisan bread certainly seemed to be correct. It was ripe for the pickin’. 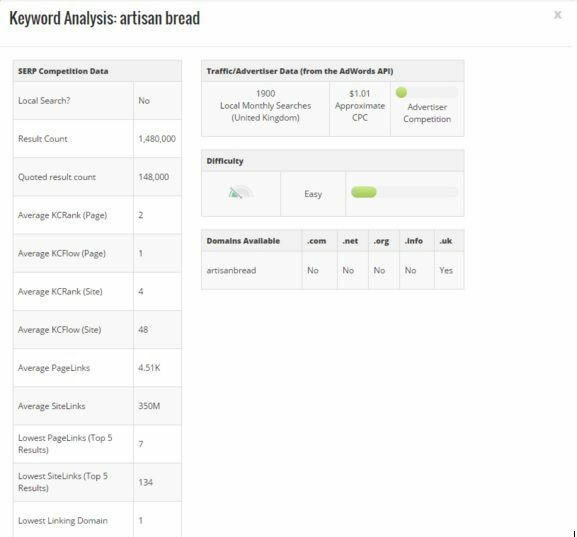 Our friend ArtisanBakers.com is ranking in the fifth position for Google.co.uk results, despite the fact that its link profile is not geared toward the UK much at all. That combined with the fact that the number one ranking result in the UK is also achieving that ranking with a limited number of links tells me that it would be easy to scoop up the additional 1,900 searches for these keywords being generated by English searchers every month. All it would take is a smattering of additional UK-centric tweaks. That would bring the value of the ranking from 4,400 to 6,300 searches a month — not to mention all of the long tails that would be easy to rank for once the primary ranking was achieved. There you have it: a great set of keywords discovered in just a minute or two using Keyword Canine. I hope you can see why I love Keyword Canine and designed it to work the way it does. As an SEO professional my time is very valuable. I need quick, accurate assessments that I can give to clients (or potential clients) to let them know if their goals and budget are well aligned with the work needed given the competition. Having all of the tools connected together in one harmonious suite makes my job a lot easier and a lot faster — and that means it keeps my profit margins higher. Jonathan Leger has been practicing SEO since the web was born in the 1990’s. He is a well-known figure in the Internet Marketing and SEO communities, and has a variety of tools and services on offer for those markets, including his flagship SEO suite, Keyword Canine.